The Model 501 controller is a perfect upgrade for your Model 500 Test System. The PC based architecture of the Model 501 Controller makes it ideal for telephone QA and design applications. 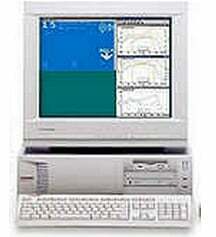 The Model 501 Controller runs on a Pentium class Windows computer with the Microtronix M501 real time controller (RTC) inside. The M501 RTC performs between 20 to 100% faster than the Model 500 depending on the type of test performed. More importantly it remains 100% compatible with all Microtronix System L4 Test Programs. You can install the Model 501 Test Program Editor (TPE) right on the controller. Test programs are quickly edited and downloaded to the internal RTC board with a mouse click. The M501 Operator Console and the Graph Manager reside on the Windows desktop. The Console program has been designed to completely emulate the Model 500 Operator Interface so re-training is not needed. The Graph Manager program, under test program control is a multi-screen plotter that creates full colour graphs of test program results. Of course all programs can be arranged on the screen to any convenient size or position. Using the optional Summary Collector software, full reports for each test are saved to local or network disk drives. The Model 501 Controller can use the complete catalogue of Microtronix Country Kit software. Any Model 500 Country Kit that you currently own in fact any L4 level Test Program you have can be loaded into the Model 501 and run immediately. The Model 501 architecture is ready for network operation. With optional software it can be completely controlled over a network. This means that test software can be downloaded into the Test Set, operator performance can be monitored, test results can be collected and even diagnostics can be run without ever leaving your desk.